Subscribe to Gaia Discovery and/or Gaia Treats and win scuba dives! Wicked Diving has joined hands with Gaia Discovery to sponsor a one-day dive trip out to the Similans and to Boonsung Wreck off Khao Lak. Two lucky winners (new subscribers) stand to win the prize of two dives to either of the destinations! Promotion is valid until 31 July 2011 in conjunction with Malaysian International Dive Expo in Kuala Lumpur. You are also welcome to visit our booth at this show! 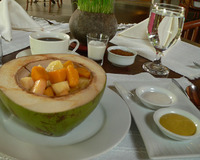 Winners will be notified in August 2011 and have until December 2011 to redeem their vouchers in Thailand. Simply contact Gaia Discovery with your details and tell us you'd like to subscribe and go diving for free! Who doesn't? We have a strict no spam email policy and we do not sell databases. Finally, an ethical dive center. Serving guests from around the world and caring for local communities and ecosystems. Wicked Diving operates within the Komodo National Park, Indonesia and the Similan Islands, Thailand. When you dive with Wicked Diving, you make a difference – 2% of all proceeds go to community projects, environmental awareness and research. Visit Wicked Diving's website at www.wickeddiving.com to read more about their dive operations and business ethics! Go on a healing journey at The Farm with its body-mind-spirit services, facilities and special programmes. Bask in the traditionally-inspired and renowned spa and feel rejuvenated. Or simply enjoy the delightful award-winning vegan cuisine. 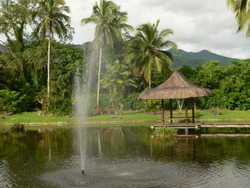 The Farm in the Philippines offers tranquil spots, yoga, walks for peace and relaxation. For Gaia Discovery readers only, now there's an opportunity to WIN a healthy-rewarding stay at The Farm, a wellness resort with a difference. 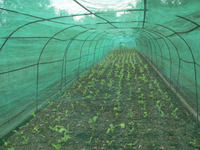 Based in Lipa City, Batangas of The Phillipines, The Farm is just about two hours drive south from Manila City. Promotion for TWO WINNERS is on from 1 February - 15 April 2011. Gaia Discovery's Founder has reviewed The Farm by interviewing the doctor in residence then. Ducks, peacocks, butterflies are residents at The Farm. Please submit your response to admin@gaiadiscovery.com. We will notify the lucky two winners in April. By submitting your response, you will automatically receive Gaia Discovery monthly eNewsletter that gives you highlights of new articles, and other reader promotions. You can always choose to unsubscribe if you no longer wish to receive this email. Gaia Love Prize - A two-night stay in The Farm's beautiful Palmera suite with breakfast for you and your loved one. Airport transfers included. Gaia Peace Prize - A 90-minute signature Spa treatment at The Farm for you and your companion. The Farm is a centre for holistic healing and wellness where people balance their mind, body and spirit with Savour exquisite vegan meals at The Farm.nourishing live foods in an eco- friendly place. The Farm is a healing journey, a “must have” in every individual’s life at least once a year. This personal journey is needed for recharging one’s mental, physical, and spiritual state. It is the sole sanctuary of its kind in the Philippines and one of the best in the world. The Farm is a life-changing retreat that enables its guests to cope with the ever-increasing stress-filled challenges of everyday life through a well-managed and tailored wellness programs for restoration of balance and harmony by encouraging a commitment to a proactive healthy lifestyle. Our vision is to establish a unique healing centre in a new dimension offering a personal journey with a total holistic approach to rejuvenation of the mind, body, and soul in an idyllic setting. To address individual requirements and administer its wide-array of wellness packages and customized detox treatment programs. The Farm at San Benito is beautifully situated on a former coconut and coffee plantation, gently nestled in the foothills of Mount Malarayat filled with gardens, ponds, mountains, rivers, lagoons, waterfalls with an abundance of tropical flowers and plants. Some food is grown organically at The Farm for freshness and health.Comfortably appointed indoor lounges and special outdoor private areas are located throughout the landscaped gardens for meditation, reading, relaxing and communing with nature. A network of walking and jogging paths provide studies in nature’s fullness and beauty. The Farm's Boutique offers a variety of things to buy including the virgin coconut oil, organic snack and comfortable lounge wear. We also offer room service, laundry facilities, concierge services, a business center and transportation services. We provide the environment, guidance and support you need to realize your maximum human potential. We believe in the body’s inherent ability to heal and maintain a healthy functioning state. We believe disease is preventable and curable, naturally. We believe detoxification regiments are highly effective tools in restoring health. We believe good nutrition is enhanced by increasing the intake of raw or “living” food, and may or may not include cooked foods and animal protein. We believe an investment in health will be one of your wisest decisions. The Farm offers Prevention and Recovery Retreat programs that focus on medically guided detoxification as a way to jump start the body cleansing process. On The Farm's approach to healing beyond the physical. GO ON TAKE PART IN THIS PROMO. SEND IN YOUR RESPONSE NOW. Singapore, 20 October 2010. Gaia Discovery rolled up its sleeves and took part in the Global 1010 climate change awareness campaign with Balik Kampong, the Singapore chapter of this event organised by Groundup Initiative. At this event, Gaia Discovery urged the fair's visitors to take a pledge in becoming more eco-friendly at work and when travelling. After taking the pledge, visitors also signed up for our eNewsletter subscription, received a sticker on the 10Rs of Responsible Living designed by Gaia Discovery, and stood a chance to win in a lucky draw - a 2N/3D complimentary luxurious stay for two persons with breakfast in any Victoria Hotels & Resorts properties in Vietnam and Cambodia. Hundreds participated. A draw was organised, and the winner was Ms Linda Tan, a private tutor based in Tampines, Singapore. Congratulations Linda! At the event, Gaia Discovery also distributed WWF environmental tracts and postcards. Exclusively for Gaia Discovery readers! Dreaming about discovering Vietnam but never had a pull? Well, here's one. 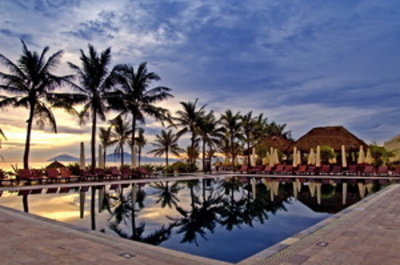 You can visit the heritage town of Hoi An while basking in the comforts of french-run Victoria Hoi An Beach Resort & Spa. All you have to do is read about Victoria Resort's Green Day and answer this question: How many times has Victoria Resorts organized a Green Day? Sounds simple? Well it is. Correct entries will be subject to a draw, and the winning Gaia Discovery Reader gets a complimentary stay for 3 nights and 4 days for two persons (yes, for you and your loved one) at the beautiful Victoria Hoi An Beach Resort & Spa. Superior room (twin or queen) with daily breakfast thrown in, one sumptuous dinner plus gift hamper. Voucher is valid from January - December 2009. Flights not included but you'll be ferried to and fro the airport. Send your winning letter to Gaia Discovery now to this email address: admin@gaiadiscovery.com. Promotion ends 31 January 2009. 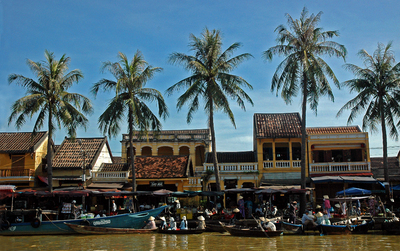 Discover Hoi An, splendour of the past Annam, a charming town listed as a UNESCO World Heritage site. Explore the vestiges of a glorious Cham past. The four-star beachside hotel is only 5 km from the ancient town of Hoi An that replicates a traditional fishing village with small streets, water ponds and village houses with clay -tiled roofs. Idyllic Hoi An riverfront.Hoi An is one of Vietnam's most picturesque towns, having been a major trading centre for silk, porcelain, pepper, cinnamon and medicinal plants. Its distinctive architecture remains intact despite the wars of the 19th and 20th centuries. Its spa has introduced a new bath menu with essential oils, herbs, spices and bath salt for an exhilarating experience. Guests can now indulge in different relaxing baths while enjoying a bottle of red wine or a soothing cup of herbal tea. Some rooms have just been given a new look under the supervision of acclaimed French architects and decorators Patrick Chauvet and Nicolas Malric; 20 rooms were enlarged to become a new category of 53sqm Junior Suites with private terraces, new bathrooms, Jacuzzis and alfresco showers, along with stylish furnishing and décor. Also, wireless Internet service, 32” flat screen televisions.In line with the hotel's environmental policy, "green building" labelled products were used such as light sensors, plumbing materials and air conditioners that economize on energy consumption. Why don't you read more of Victoria Resorts & Hotels by visiting their website at www.victoriahotels-asia.com. 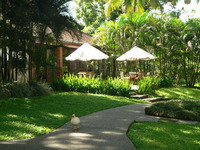 More on Victoria Hoi An Beach Resort & Spa here. So what are you waiting for? Email away to a rare Indochine experience! And the winner is Ms Gunver Bennekou in Roskilde, Denmark. Congratulations! Congratulations Josephine Poh, a Vice President with Matador from Singapore. She was a lucky reader to win from a raffle of subscribers. Next raffle for another Djembe winner is September 2008. Love percussions? Look no further for here's a boom-worthy djembe just waiting to be grabbed. All you have to do is to subscribe to Gaia Discovery eNewsletter. Two subscribers, new or existing, will have chance to own this marvellous musical instrument (20-30 cm tall) through a draw. A thumping reward for Gaia Discovery eNewsletter subscribers only. Not a subscriber yet? Well why don't you become one right now. Don't be surprised if you get an email declaring yourself the winner. WINNER OF Techung CD - a Compilation of Tibetan Folk and Freedom Songs. Congratulations, Anusha Kanagasabai, producer with Astro Mix FM from Kuala Lumpur, Malaysia for your coolest response. You're in for a folksy treat! Autographed by award-winning Techung with English lyrics featuring tracks such as Rang Zen – Independence, Nying Thop – Courage, Zhi Wai Gang Seng – The Snow Lion of Peace and Drechang Silma – Fresh Rice Chang. Winner of the 2006 JPF Asian Album of the Year. Read Gaia Discovery review of Techung's music. Sonja Boon of Vizpro Entertainment, part of MediaCorp TV 12 in Singapore is the thrilled winner of Gaia Discovery-Stiff Chilli Villa Promotions where she gets to soak in the full glory of nature in Uluwatu, Bali for three nights and four days. She recommended the most number of readers to Gaia Discovery - highest at 33! Congratulations Sonja. Don't forget to take your MP3 with you! Gaia Discovery is an independent production that upholds editorial integrity at all times. By agreeing to partner Gaia Discovery Reader's Promotions in the donation of products, sponsorship of accommodation or gifts as prizes, partners and sponsors enter into an agreement not to exercise any authority or influence over editorial content. They may not request to vet copy prior to it being published or seek amendments thereafter.